Oysters are raised in a tank, allowed to attach to fibers, then grown in sea water for two to three years. Growing oysters are suspended in cages hung from rafts. They feed on plankton. Healthy oysters are selected for pearl cultivation. The bead is prepared. Mikimoto use Pig toe clam shells, from the Mississippi River. Small balls are prepared from pieces of these shells. An example of a mother of pearl bead. Living oysters are wedged open and a piece of mantle lobe harvested from an other oyster, plus a bead, are inserted into the soft tissue. This image shows insertion of mantle tissue and bead. Here is a labeled version of this image, showing the important components. Oysters are then returned to the sea, where they are suspended in cages 7 - 10 feet below the surface. They are maintained and harvested after some time. The culture period used to be ~ 3.5 yrs, producing ~ 1mm layer on the bead, but now the culture period may take less than 2 yrs. The commercial production method is now known as the Mise-Nishikawa method. Typical results show that 5% are high quality pearls (hanadama), 28% are not high quality but are marketable pearls, 17% are unmarketable pearls, 5% are uncoated nuclei and 50% of oysters containing nuclei will die. 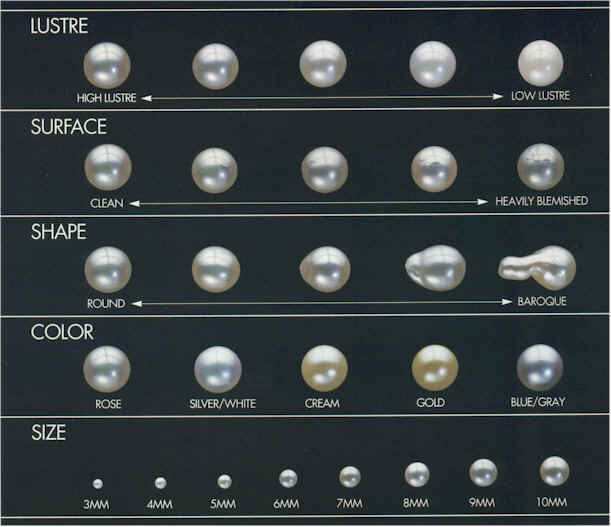 The selection and presentation of pearls is by their size and color (hue). Careful color grading is extremely important. 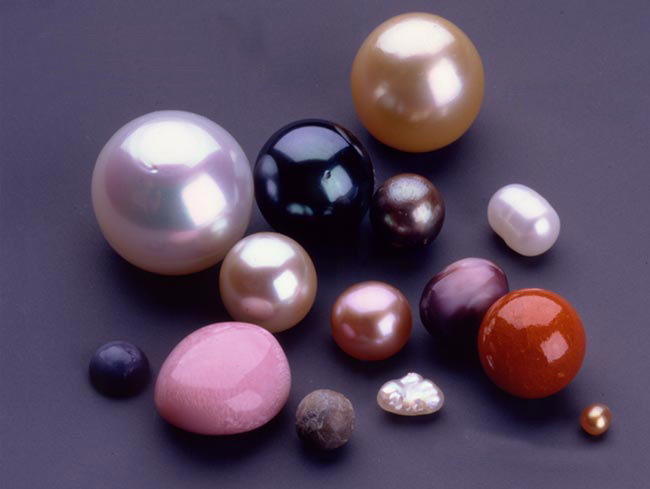 Pearls are then drilled from both sides, often at a place that is slightly flawed. They are then sorted, treated, and marketed.